Socialists differ from nationalists in that their concern for the welfare of others is not confined to arbitrary boundaries of nations and states. In modern times, as transport and technology has advanced, so the time , scope and range of communication and trade has expanded. One world, one community, one people is a possibility. But the reality is that it is not national boundaries which define and divide us, but wealth, class and property. And above all – power. Clearly external pressures were being exerted on Heath’s government. Britain and American intelligence services supported Britain’s entry into EEC to oppose the Communist bloc. Funding was put in place to influence public support. The Cambridge Clarion (3) describes how the MI6 pushed Britain to join Europe. “A secretly-funded Foreign Office unit used public money to mount a covert propaganda operation aimed at ensuring Britain joined the European Community. British and American intelligence services had traditionally supported Britain’s entry into the European Economic Community us a bulwark against the Communist Eastern bloc. The CIA funded the European Movement, the most prominent extra-governmental group, seeking to influence public opinion for a European Community. Between 1949 and 1953, it was subsidised by the CIA to the tune of £330,000. In June 1970 Edward Heath’s Conservative government had been elected with a pro-European manifesto. But public and parliamentary support for Europe was slipping and Britain’s entry was in doubt. Although the Cabinet was dominated by pro-Europeans, Heath presided over a party that was deeply ambivalent about the “Common Market”. 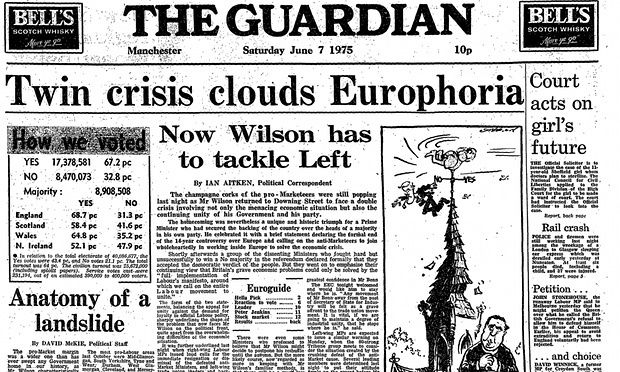 The Labour party were split on the issue, with many grassroots opposing remaining in Europe and Wilson called a referendum on the issue of whether to remain: The Common Market Referendum on 6th June 1975. (4) At that time, I voted “No”, feeling that it was a treaty backing private business and had little to offer working people. The No campaign included the left wing of the Labour Party, including the cabinet ministers Michael Foot, Tony Benn, Peter Shore, Eric Varley, and Barbara Castle. Some Labour “No” supporters, including Varley, were on the right wing of the party, but most were from the left. The funding supporting European Entry clearly was effective, and even the Daily Mirror attacked those opposing the entry as lunatics and extremists. Much of the “Yes” campaign focussed on the credentials of its opponents. According to Alastair McAlpine, “The whole thrust of our campaign was to depict the anti-Marketeers as unreliable people – dangerous people who would lead you down the wrong path … It wasn’t so much that it was sensible to stay in, but that anybody who proposed that we came out was off their rocker or virtually Marxist.”. [ Tony Benn controversially claimed “Half a million jobs lost in Britain and a huge increase in food prices as a direct result of our entry into the Common market“, using his position as Industry Minister as an authority. His claims were ridiculed by the “Yes” campaign and ministers; the Daily Mirror labelled Benn the “Minister of Fear” and other newspapers were similarly derisive. Ultimately, the “No” campaign lacked a popular, moderate figure to play the public leadership role for their campaign that Jenkins and Wilson fulfilled in the “Yes” campaign. The establishment control of the press has been effective at attacking those using democratic means as extremists. Michael Foot, Tony Benn, and Neil Kinnock were neither loony, extreme-left, dangerous nor undemocratic. Later, at the time of their deaths, when they could no longer challenge the establishment, Michael Foot and Tony Benn were admired and appreciated as men with intelligence and courage. The strength of that courage is precisely why the press attacked them, and continue to attack anyone who questions the status quo. That is the reason we have plunged blindly into neoliberalism, with a Labour Party impotent and fearful of the media. The No campaign also included a large number of Labour backbenchers; upon the division on a pro-EEC White Paper about the renegotiation, 148 Labour MPs opposed their own government’s measure, whereas only 138 supported it and 32 abstained. 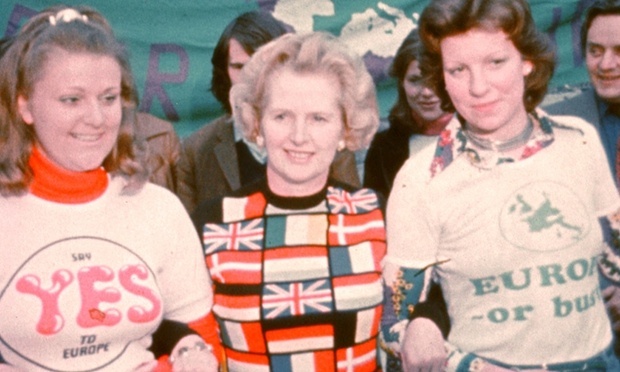 The Guardian (6) reported the outcome of the 1975 referendum with a smiling Margaret Thatcher . …and reported that Wilson needed to take on the opposition from the Left. Certainly, I can recall that within Labour meetings, more positive aspects of being more closely allied within Europe began to emerge. It is a long time ago, I wonder how many others can recall how opposition to Europe from the Left began to crumble, as there was talk of a Social Contract, treaties supporting workers’ rights and a renewed solidarity across Europe? As socialists, the fraternal support of the left across Europe seemed a positive force – the idea of “united we stand, divided we fall” and so on. The greatest influence, was no doubt the danger at home – an extreme, right-wing reactionary government with Thatcher privatising everything in sight with Reagan encouraging her from across the ocean. Our own Labour Party of the 80s and 90s no longer opposed the neoliberalism game. Enthusiasm for Europe and monetarism was pursued by a Labour Party led by John Smith and later Tony Blair. Labour had joined the race and power for Blair was an addiction, and the Left voice against Europe was silenced – gagged even. Europe seemed the friend and the US the enemy. 1. The flow of profits out of Europe to the US-owned firms. 2. The colonisation in an economic sense of Europe by US firms. The real crisis now in Greece (10) was inevitable in hindsight, as far from a united people in Europe, some were very much stronger than others.The most powerful economy in the Eurozone was Germany, and so served its own interests. Weaker countries such as Greece struggled, and neighbours withheld aid as the global financial crisis struck. Greece has been abandoned, and even when Greece democratically elected a party opposed to austerity measures, the financial power base of the ECB pressures those people against their democratic will. If we take a look at Spain, (11) where gagging laws have been compared to the days of Franco’s dictatorship, we see another example where democratic expression becomes a sham. There is a limit to freedom of speech and curbing the right to peacefully protest with the introduction of fines ranging between €100 ($111) and €600,000. 1) Fines for protesting Under the new law, anyone who organizes or takes part in an “unauthorized protest” could be fined between €30,000 and €600,000 if the protest takes part near institutions such as the Spanish parliament. 2) Disrupting public events Disrupting events such as public speeches, sports events or religious ceremonies could face fines of between €600 and €300,000. 3) Botellón The Spanish tradition of getting together with mates for outdoor drinking sessions looks to be officially over – drinking in public will be hit with fines of €600 under the new law. And teenagers won’t escape – Parents will be held responsible for the payment of their offsprings’ fines. 4) Social media activism Using Twitter, Facebook or Instagram to call on people to protest will be fined under the new law, an attempt to put paid to the spontaneous protests that have proved very powerful in building the indignado movement. 5) Photographing police People will be fined for taking unauthorized photographs of the police, a measure introduced with the argument that being publicly identified could put officers and their families in danger. 6) Smoking weed It puts an end to the laissez-faire attitude that has seen Spain become a nation with one of the largest potsmoking populations in Europe. But from now on lighting up a joint in bars or on public transport could result in a fine of between €600 and €30,000. 7) Leaving furniture in the street It is a tradition that has existed in Spain long before the current upcycling trend but from now on dumping unwanted furniture in the street could come with a penalty. Those caught obstructing streets with old furniture, cars or other unwanted items will be fined. 8) Trying to stop an eviction People trying to stop an eviction from taking place could be fined between €600 and €300,000. The number of evictions in Spain has skyrocketed since the beginning of the economic crisis. 10) Disrespecting a police officer Showing a “lack of respect” to those in uniform or failing to assist security forces in the prevention of public disturbances could result in an individual fine of between €600 and €30,000. Is Big Brother watching us? Undoubtedly. How many recall the passing of 1984, and thought of Orwell’s predictions of Big Brother? The Orwellian world in which we now find ourselves is more terrifying than the books we read at school. There again, it cannot be long before the books disappear and history rewritten, so when those who can remember have gone nothing else remains. It is not that everything in Europe is bad news for Britain, or vice versa. It is right that we continue to travel, to befriend, to trade with and support those across Europe and the world. But what is wrong, is to continue to play the game, like counters in a game of Risk, pushing people to despair, withholding their livelihoods in the name of a European Economic Community. The European Union is both anti socialist and anti democratic. (12) It is not for the Labour Party, founded to protect working people to continue to pursue policies which blackmail states and their democratically elected representatives. This is why, while I will not walk away from Europe, or turn my back on people in need in Europe, the world, or next door – when the next referendum comes I will vote “No” again. Vernon Coleman “Did Heath’s government enter the common market illegally? Cambridge Clarion: How MI6 pushed Britain to join Europe using public money to mount a covert propaganda operation. Are we already in the post democratic era? This entry was posted in Austerity, Banking, Children and Youth, crime and civil liberties, Economics, Education, Employment, Energy, Environment, Finance, Foreign Affairs, Gender, Globalisation, Government policy, Health, Housing, Opinion, Policy Documentation, Privatisation, Propaganda, Tax havens, The EU, Topical News, Unions and Political Activism, Welfare reform and tagged austerity, Banking, banking crisis, common market, democracy, economics, EU, Greece, Humanity, neoliberalism, Referendum, Spain, welfare reform by Pamplemousse. Bookmark the permalink. A really good article. I have saved it to my computer to refer to it when I need to. “Post democratic era?” . Have we ever had a true democracy? The Ruling Classes have never been swayed by public opinion, except in times of full blown revolution ( 1775, and 1917) It doesn’t take long before the power struggles sort themselves out, and we are under new “Ruling Classes”. They just sit back and wait until the dust settles, then emerge as powerful as ever. Identifying these people is the challenge, and modern improved communications has made it easier. The real problem is that most people either do not understand what’s going on, or are easily conned by right wing propaganda, or just don’t care. Keep up the good work! Thanks, 🙂 It’s one of those articles which it seems, writes itself. Yes, we talk of the ruling classes… who are they? Well, there are more of us. Today the Greek people showed their strength in a dignified way, which warrants respect. If a force tries to exert influence on a group of people against their will – is it legal, is it moral, is it peaceful?